The band, whose hits include Parklife and Song 2, announced on Facebook they would return with their eighth album, called The Magic Whip, on 27 April. It was borne out of a five-day recording session in Hong Kong in 2013. Lead singer Damon Albarn said: "I really thought that was it, that was the end - it had run its course. "The record was accidental, spontaneous." The album was announced in a live video chat with Radio 1 DJ Zane Lowe. Lowe described the album as "amazing". One of the tracks, Pyongyang, was inspired by Albarn's trip to North Korea. The band went mainstream with their third album, Parklife, in 1994, before a much-publicised spat with Oasis the following year. The Britpop rivals released singles on the same day, with Blur's Country House beating Oasis' Roll With It to number one. Their last studio album, Think Tank, came in 2003 before the band parted ways to pursue solo projects. 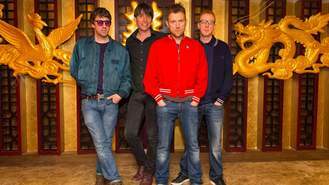 In 2012, Blur received a Brit Award for Outstanding Contribution to Music. The band have also announced they will return to the stage for the first time since 2013 by playing Hyde Park on 20 June.